So it turns out that when you focus on knitting one thing for a few days, it gets knit! This is the sunny yellow shawl (and it really needs a better name than Sunny Yellow), already a couple of rows into the border and looking pretty good for completion this weekend. As soon as the needles for the green shawl get here, that's up for completion too, and I'll have two more things off the needles. I also have a bit of computer work to catch up on. I have a hat pattern to finish writing up, and I don't think I've mentioned it here yet, but I deactivated my Epidemic pattern to update the formatting and add more sizes. Like, six more sizes. It bothered me that I personally feel so strongly about diversity and body positivity and self-love but I'd only written that pattern for three sizes. It had felt wrong for a while, and I decided that now was the time to fix it before I get too deep in other projects. It's almost ready to go off for editing, and I'm already so much more pleased with it. Book-wise, I finished Beauty by Sheri S. Tepper earlier this week, and I really enjoyed it. I'm surprised that I'd never heard of it before, since it has pretty much everything I love. I'm finally getting into In the Woods now-I'd read the introduction back when I bought it way back in December, but then I'd let it languish. I'm really enjoying it now, though, and I'm hoping to make quick work of it since I'm seven books behind my way-too-ambitious reading goal for this year so far. But I also have Neil Gaiman's new collection that I'm working through, and there's a new Fairyland book as well, so I think I may re-read that whole series. 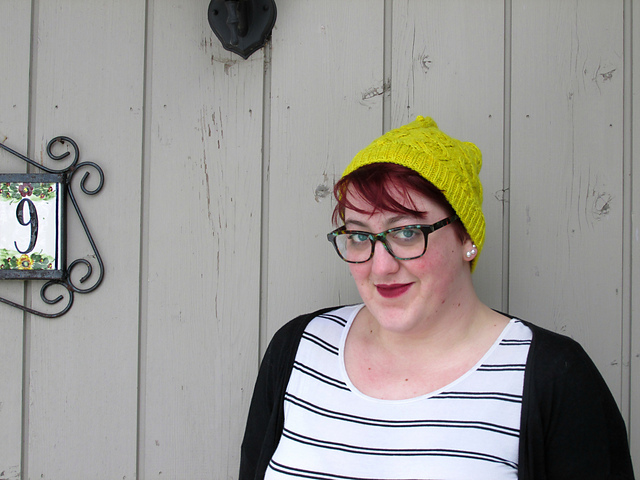 Last, but (hopefully) not least, I've made a Facebook page for The Wayward Knitter. It's still a baby page right now, but I'll be adding photos and things to it over the next few days. PS I really like your banner picture on your FB page. it makes me want to go out and buy yarn! Thank you! I'm always glad to help someone want to go yarn shopping. Who would've thought things get knit if you work on them, I need to try this! (I've been project hopping far too much lately). I adore the yellow shawl you're making so much! Right? I wish I'd known this incredible secret before now! Thank you-this has been such a fun shawl to work on. Thanks! I never thought of it, but Sunny Yellow might have to be my hippy band name! The color and texture of your shawl is so perfectly springy! And that's really cool that you're reformatting your pattern to reflect your thoughts about body positivity and sizing. It's so important to have representation and resources to build healthy body image for all shapes and sizes, and it's awesome that you're contributing to that. Thank you! It really had been bothering me, so I'm glad to be working on that. Thanks! It's such a fun color, it's been great to work on.